March 20, 1847:First official day that Ignaz Philipp Semmelweis assumed his position as assistant physician in the maternity clinic in Vienna, Austria. Semmelweis is credited with recognizing the high death toll among women during childbirth caused by physicians using unsanitary procedures. He instituted the disinfection of physicians’ hands with a concentrated chlorine solution and the death rate of new mothers plummeted. His research and practical applications assisted later proponents of the germ theory of disease and also indirectly contributed to the use of chlorine for disinfection of drinking water. “Ignaz Philipp Semmelweis(July 1, 1818 – August 13, 1865) (born Ignác Fülöp Semmelweis) was a Hungarian physician now known as an early pioneer of antiseptic procedures. Described as the “savior of mothers”, Semmelweis discovered that the incidence of puerperal fever could be drastically cut by the use of hand disinfection in obstetrical clinics. Puerperal fever was common in mid-19th-century hospitals and often fatal, with mortality at 10%–35%. Semmelweis postulated the theory of washing with chlorinated lime solutions in 1847 while working in Vienna General Hospital’s First Obstetrical Clinic, where doctors’ wards had three times the mortality of midwives’ wards. He published a book of his findings in Etiology, Concept and Prophylaxis of Childbed Fever. Reference: Semmelweis, Ignaz. The Etiology, Concept, and Prophylaxis of Childbed Fever. Translated by K. Codell Carter. Madison:University of Wisconsin. 1983. This entry was posted in Year 7 TDIWH and tagged childbed fever, chloride of lime, chlorine, Ignaz Philipp Semmelweis, public health, puerperal fever, water, water history on March 20, 2019 by safedrinkingwaterdotcom. August 13, 1865:Death of Ignaz Philipp Semmelweis. Semmelweis is credited with recognizing the high death toll among women during childbirth caused by physicians using unsanitary procedures. He instituted the disinfection of physicians’ hands with a concentrated chlorine solution and the death rate of new mothers plummeted. His research and practical applications assisted later proponents of the germ theory of disease and also indirectly contributed to the use of chlorine for disinfection of drinking water. This entry was posted in Year 6 TDIWH and tagged childbed fever, chloride of lime, chlorine, Ignaz Philipp Semmelweis, public health, puerperal fever, water, water history on August 13, 2018 by safedrinkingwaterdotcom. March 20, 1847: First official day that Ignaz Philipp Semmelweis assumed his position as assistant physician in the maternity clinic in Vienna, Austria. Semmelweis is credited with recognizing the high death toll among women during childbirth caused by physicians using unsanitary procedures. He instituted the disinfection of physicians’ hands with a concentrated chlorine solution and the death rate of new mothers plummeted. His research and practical applications assisted later proponents of the germ theory of disease and also indirectly contributed to the use of chlorine for disinfection of drinking water. 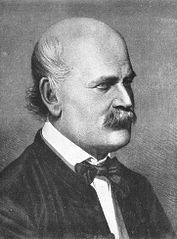 “Ignaz Philipp Semmelweis (July 1, 1818 – August 13, 1865) (born Ignác Fülöp Semmelweis) was a Hungarian physician now known as an early pioneer of antiseptic procedures. Described as the “savior of mothers”, Semmelweis discovered that the incidence of puerperal fever could be drastically cut by the use of hand disinfection in obstetrical clinics. Puerperal fever was common in mid-19th-century hospitals and often fatal, with mortality at 10%–35%. Semmelweis postulated the theory of washing with chlorinated lime solutions in 1847 while working in Vienna General Hospital’s First Obstetrical Clinic, where doctors’ wards had three times the mortality of midwives’ wards. He published a book of his findings in Etiology, Concept and Prophylaxis of Childbed Fever. This entry was posted in Year 6 TDIWH and tagged childbed fever, chloride of lime, chlorine, Ignaz Philipp Semmelweis, public health, puerperal fever, water, water history on March 20, 2018 by safedrinkingwaterdotcom. August 13, 1865: Death of Ignaz Philipp Semmelweis. Semmelweis is credited with recognizing the high death toll among women during childbirth caused by physicians using unsanitary procedures. He instituted the disinfection of physicians’ hands with a concentrated chlorine solution and the death rate of new mothers plummeted. His research and practical applications assisted later proponents of the germ theory of disease and also indirectly contributed to the use of chlorine for disinfection of drinking water. This entry was posted in Year 5 TDIWH and tagged childbed fever, chloride of lime, chlorine, Ignaz Philipp Semmelweis, public health, puerperal fever, water, water history on August 13, 2017 by safedrinkingwaterdotcom. This entry was posted in Year 5 TDIWH and tagged childbed fever, chloride of lime, chlorine, Ignaz Philipp Semmelweis, public health, puerperal fever, water, water history on March 20, 2017 by safedrinkingwaterdotcom. This entry was posted in Year 4 TDIWH and tagged childbed fever, chloride of lime, chlorine, Ignaz Philipp Semmelweis, public health, puerperal fever, water, water history on August 13, 2016 by safedrinkingwaterdotcom. This entry was posted in Year 4 TDIWH and tagged childbed fever, chloride of lime, chlorine, Ignaz Philipp Semmelweis, public health, puerperal fever, water, water history on March 20, 2016 by safedrinkingwaterdotcom.